You are here: Home / David Ebsworth Books / Waterloo – Women on the Battlefield and the Lengths They’ll Go To! Waterloo – Women on the Battlefield and the Lengths They’ll Go To! It frightens me to think that I first read Stendhal’s The Charterhouse of Parma almost fifty years ago. And, I have to be honest, I didn’t enjoy it very much as a teenager. The adventures of Fabrice del Dongo weren’t particularly exciting, in my eyes, and the author’s depiction of the Battle of Waterloo seemed almost farcical. 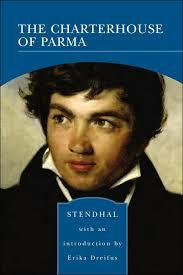 But, of course, back then I had no appreciation of the fact that Stendhal (real name Marie-Henri Beyle) had himself been a soldier in Napoleon’s army and, writing the book in 1839, he was keen to represent the chaos of war from the viewpoint of its front-line participants. But something must have stuck in my mind from that early reading because, when I was looking for an angle for my own Waterloo novel, I remembered the other character who so influences Fabrice during his time on that most famous of battlefields – the nameless cantinière. Stendhal doesn’t tell us much about this woman – because, in 1839, the role of the cantinière would have needed little introduction. 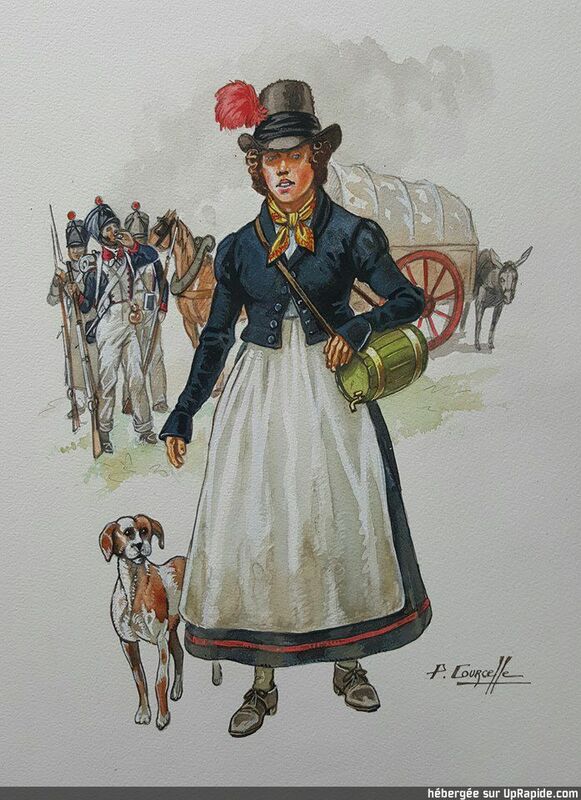 Every French army unit – infantry and cavalry – had its own complement of women, with the cantinières or vivandières acting as sutlers, victuallers and laundresses who provided the soldiers with all the supplies missing from their basic supplies and, most importantly, their tobacco and brandy. By the time of the Napoleonic Wars, cantinières could regularly be found in the front lines during battles, risking their lives (and frequently losing them) and serving rotgut brandy to the men of their regiments. At Waterloo, for instance, it’s likely that there may have been as many as 600 women on the battlefield itself. And they would have been prominent on all other Napoleonic battlefields too. Just one example is the remarkable (and true) story of Madeleine Kintelberger, who served with Bonaparte’s 7th Hussars during the Austerlitz campaign and was caught up in fighting against the Russian Cossacks while protecting her children, who were also with her on the battlefield. Her husband had been killed by cannon fire and Madeleine held off the Cossacks with a sword she had picked up, losing her own right arm in the process. She was slashed by sabres and speared by lances during the same engagement, as well as shot in each leg. Yet she was also six months pregnant with twins. It seems nothing short of a miracle that she survived at all. The Russians took her prisoner and she eventually returned with her wounded children to France, where she was received in person by the Emperor and awarded a military pension. These weren’t the only women in the French front lines, of course, since there were many serving as soldiers too, certainly during the early years of the French Revolution – legendary women warriors like Marie-Thérèse Figueur, who published her memoirs in 1842. Figueur had served in Dragoon regiments, in her own right as a woman, from 1793 and fought in almost every major campaign until her retirement in 1814. Regula Engel, on the other hand, had been born in 1761 and, aged 17, married a soldier of a Swiss regiment in the service of France. She followed him to battlefields in Egypt and across Europe, sometimes cross-dressing, she says, to fight in the front lines – while also bearing a total of 21 children. Yes, 21! Her husband died at Waterloo (where Regula also fought and was seriously wounded) and, in the aftermath, two surviving sons were part of the bodyguard accompanying Bonaparte into exile on St Helena. She was unable to accompany them and had lost contact with her last surviving daughter. In 1817 she travelled to New Orleans in search of another son Caspar although, on arriving, found that he’d died of fever only days before. In 1821 she was helped to publish her memoirs to supplement her meager income. But it was the cantinières and vivandières who fascinated me. And then I discovered Thomas Cardoza’s wonderful book, Intrepid Women. Cardoza explores not only the exploits of these individual women but also the mixed motivations that drew them into this particular way of life. In the Napoleonic army, there were rigid regulations limiting the number of licences available for cantinières to four for each infantry battalion and two for each cavalry squadron. Regulations too about potential applicants or, indeed, criteria by which numbers might be reduced where there were surpluses. So what were the drivers that brought these women onto the battlefields of Europe? We know a great deal from research by Klein-Rebour, 1960: Les Femmes Soldats à Travers les Ages, or directly from French army records, and from memoirs of men like Louis-Jacques Romand’s memoirs, who wrote his original manuscript in 1819. Romand served in the 81st Infantry Regiment and was wounded at Waterloo. His cantinière, he tell us, “received numerous bullets in her clothes that fortunately did not wound her” and went to extraordinary lengths to care for the wounded. Romand includes details of a more famous cantinière, Marie Tête-de-Bois. From these sources, we know that the following cases are fairly typical. Jeanne Domanay was a domestic worker who met and married a private of the 15th Infantry Regiment, successfully won a licence as a cantinière and served in that position until her death in 1807. A common reason, this need to stay near a husband. Marie Pierrette, on the other hand, was one of the many dispossessed, born of unknown parents, and enlisting as an army laundress and vivandière simply to escape poverty. 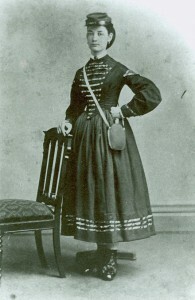 Elizabeth Haro was a “daughter of the regiment” – who earned her position in the 36th Infantry Regiment because her mother and grand-mother had held it before her. It needs to be remembered that, in 1815, there must have been at least a thousand women serving in the French army and, therefore, a couple of thousand children. The boys were almost universally and automatically apprenticed into the army too – so no surprise that many of the girls should have followed the same route. 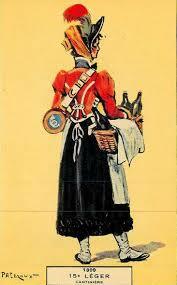 And Marie Tête-de-Bois was another women born into the army. She and her son and her husband all fought at Waterloo, and all died there, during the last stand of the Imperial Guard. Louis-Grabriel Montigny (captain and staff officer) published his Souvenirs in 1833, though written earlier, devoted a whole chapter to Marie – though it reads more like a novel. But Montigny’s chapter ended up as a newspaper article in the Sentinelle in 1837. And then, of course, there were women with a simple thirst for adventure. 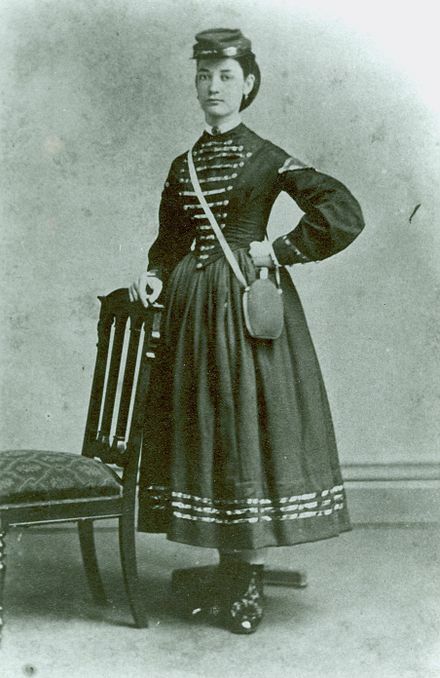 Women like Joséphine Trinquart, cantinière of the 63rd Infantry Regiment, who seems to have regularly pushed herself into the most extraordinary adventures – rescuing her battalion commander, killing two Cossacks with a bayonet. But others were driven by more patriotic reasons. 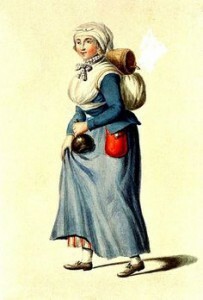 Marianne Ressouce, for example, originally joined a Volunteer Battalion in 1793, plainly through her love for France. But, whatever the motivation, these women became a crucial part of the Napoleonic armies – to provide nursing, transport, drinks under fire, cooking, rescuing of the wounded, foraging, services as bankers and midwifery. And they set a pattern that survived in the French army until 1906. In addition, the use of cantinières and vivandières spread to the armies of Spain and Italy. And then, during the Crimean War, the USA sent observers to the conflict with a view to studying military organisation in Europe. They brought back the concept and value of vivandières and, when the American Civil War broke out, such women were recruited in large numbers by both Union and Confederate regiments. Interestingly, almost all of those whose reasons for enlisting are recorded show that it was patriotism, loyalty to their respective State, or side of the conflict that caused them to follow the drum. In The Last Camapign of Marianne Tambour, that feature of patriotism gave me the chance to use my two main characters – the Dragoon trooper, Liberté Dumont, and the cantinière, Marianne Tambour herself – in an exploration of their own identities. Primal issues, like simple survival. Or Marianne’s very typical cantinière problem of caring for her child in the midst of battle. But Liberté in particular owes her right to serve in front line combat roles to the aftermath of the 1789 Revolution – and women in France have had that right ever, since while Britain remains the only country in Europe where that right doesn’t exist. We regularly take our women soldiers into front line danger – in logistics, communication, intelligence, engineering, medical services and many other roles – but still never trust them with a trigger. So I hope that some of these fascinating features have carried over into The Last Campaign of Marianne Tambour, and I owe a huge debt to Stendhal for planting the seed about cantinières in my head all those years ago. Of course, those of us in front line combat support did have weapons training and carried weapons. 😉 Have to say that if some Russian had been running towards me with negative intent, I would certainly have pulled the trigger! But as you say, regular infantry service is a step that hasn’t yet been taken in the UK.